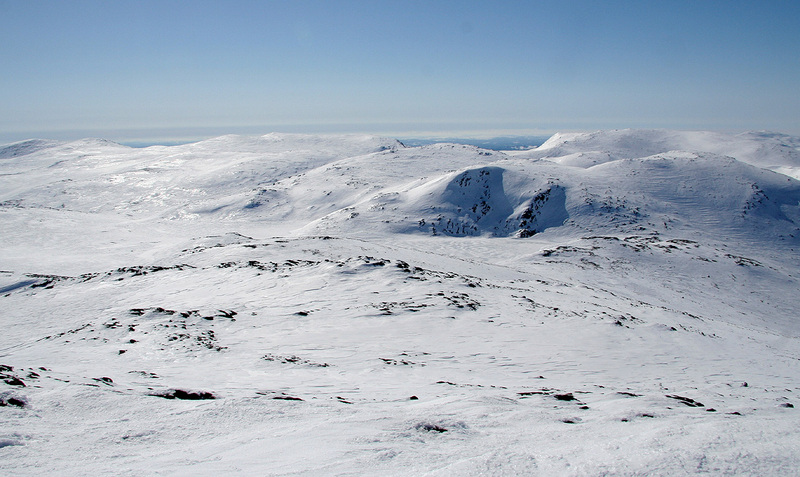 How to get there: This mountain is located near the ski resort area of Hemsedal. Hemsedal is about 3 hours from Oslo (Hwy. E-16, then Hwy. 7, then Hwy. 52), or 4 hours from Bergen (Hwy. E-16, then Hwy. 52 from the Lærdal valley.) From Hemsedal center (near a Shell gas station), proceed in the direction towards Bergen for about 4 kilometer to a small place called Tuv. Here, the main Hwy. forks left while a smaller road forks right, the sign reads Grøndalen. Take this smaller road and continue up the valley for about 6 kilometer. The base of skilifts and access to the (smaller) ski area should come up on your right. Continue a short stretch beyond this point along the main road and locate a new road that goes right with a sign for Harahorn. Take this road as it zig-zags steeply up the hillside, first on the left side of the creek, then across a bridge before it continues to climb on the right hand side of the valley. After about 3 kilometer, and near the top, the road branches with a right curve access through the gate to the resort of Harahorn (rustic style), while the left branch will lead you to a self serve toll gate. The machine will accept 40 NOK (say 2 times 20), issue a ticket and open the gate. A short drive and you arrive at a pretty large parking area. Park here, this is the trailhead. Location N60:56.527, E008:26.988, elevation 1130 meter. This trailhead is just south of the Lake Vadvatnet. Route description: There are several possible routes. In winter, the perhaps most reasonable route proceeds as follows (see also remarks below under comments). From the parking, follow a possibly marked route as you climb on a course slightly east of south. The objective is to turn Harahorn on its south side. The terrain is very gentle and you may pass below the west ridge at about 1300 meter elevation. Continue on the south side, gradually turning north as you reach the small lake of Kringletjern (1328m). From here, climb the large and gentle slope on a north-west course. Aim for the point 1664, marked on the map. A nice alternative is to proceed up this slope, straight west, heading just south of point 1650, then turn north into the valley termed Øvre Skardet at elevation about 1570 meter. Either way, proceed to the lake Isbretjerni, 1616 meter, just north of Point 1734. Continue straight north-west, you will then enter a gentle, down sloping valley. Descend about 100 vertical meter (this valley ends in steeper terrain further down!) Exit east, and locate the small lake Tortjerni, 1522m. This lake should be approached on its north side, there is avalanche danger on the west side. Proceed south across the double col named Guteskardet and continue your ascent in order to gain the distinct valley south of Point 1697. 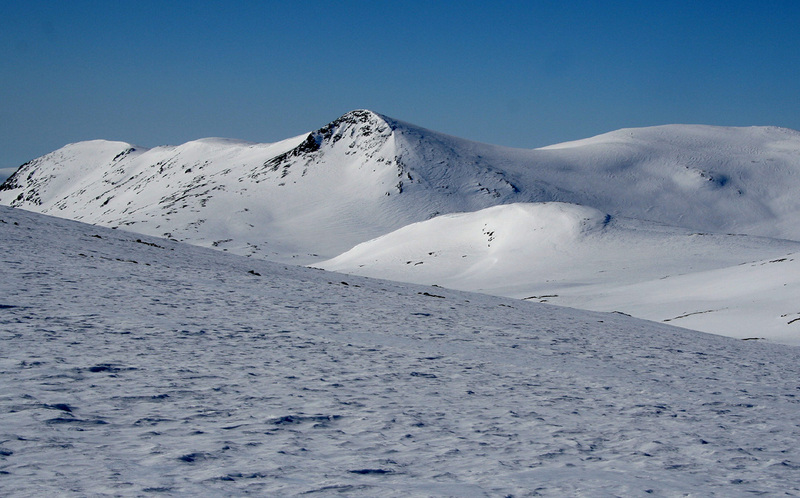 Turn north-east into this valley, then proceed more or less directly to the summit of Veslebotnskarvet. This mountain has two summits of nearly equal height. The higher point with a nice cairn is located to the north-east. Note: An alternative route would be to stay south of the Point 1734 mountain, however this route has not been completely checked out. Comments: The weekend weather promised to be just perfect. Saturday was spent repairing broken things at home. I decided to travel to the east part of Norway provided that I woke up early (really early!) Sunday morning. Having spent Easter in Colorado, this would be my single day of "Easter like skiing", the way I am so used to. The mountains should be rolling, not steep, they should be continuous and cover a single, large area above timberline. These are the characteristics of mountains in the eastern part of Norway. I woke up at 0400, just perfect. 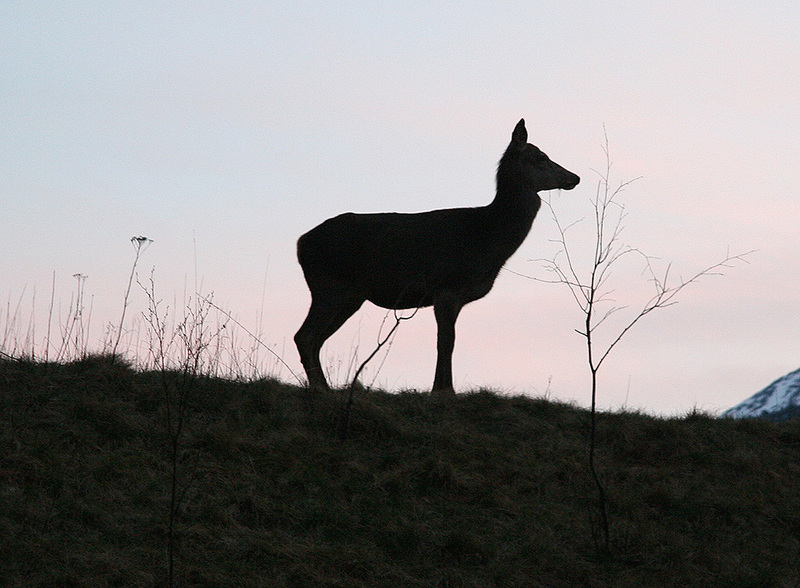 I stashed everything in the car, and took off in the dark of night. The temperature was mild and I drove my cabriolet with the roof down. The roads were largely empty and I made good progress, daylight comes early and soon I was in Lærdal. I parked shortly before 0800, applied a layer of "Universal" klister on my skis and could leave the trailhead at 0800. What a beautiful morning, no wind, I skied in my wool Devold shirt, no more needed. Blue sky and the sun already hitting the summits around me. My plan called for skiing the route described above, then possibly visiting the two peaks Point 1734 and Harahorn along my return route. However, when reaching Kringletjern, I took a brief glance at my map and decided to explore a route going entirely south of the Point 1734 mountain. I aimed for what looked like the proper col and truly enjoyed the weather and skiing, absolutely nobody to see this early, but perfect weather and skis, no hurry whatsoever. Upon reaching the col, I traversed left, keeping my elevation and soon ran into a pretty steep slope below me. Surprise, I had a memory of a gentle slope through this col. I consulted the map (again briefly!) and noted that the col further right (south) indeed had a steep side. Having enjoyed the weather and skiing more than being focused on where I was going, I immediately (and wrongly!) concluded that I was in the wrong col. Easy fix, backtrack, climb gently as you contour around this hill in order to emerge further north in the proper col.
As I executed this strategy to almost perfection, there was only one small detail missing. I emerged back higher up, but no col, only a slope that continued all the way up to Point 1650. Bummer! A new consultation with the map revealed my somewhat careless map reading. I had been in the first col, but too far north. Right in front of me was a distinct valley called Øvre Skardet. I was indeed just below the summit of Point 1734, an objective I had considered for my return ski. It seemed tempting to climb this peak directly from where I was, violating a pretty good principle of first going after the primary goal of any trip. The weather was indeed as perfect as you can get it, under such conditions it is sort of ok to just ski around, eventually getting somewhere. I thus proceeded straight uphill to the summit of Point 1734. I arrived around 1015 and had a short rest while looking around, still a bit surprised that there were absolutely nobody else out skiing. From here, I could at least look across to Veslebotnskarvet. The distance did not scare me. I observed that the west side was steep, but remembered that I could ski down the ridge, then turn down into the saddle separating the two mountains. Just in line with my navigational skills today, I located the col below me and another steep slope leading down to the broad double saddle (Guteskardet) below. How steep? Carefully exploring this, I decided that it was not too steep, given the current conditions. This slope should not be skied with avalanche conditions. An old avalanche was just a few meter further north. My route description above, describes how to avoid this passage altogether. With no more surprises I reached the summit at 1130. Time for photography, time for lunch, time for a continuously look around on the white mountain landscape. Jotunheimen easily recognized to the north, then a very wide view with few mountains further east and partly south. The west is dominated by more gentle, rolling mountains where each peak blends with the next. My name skill in this area is far below any reasonable standard. I left the summit just before noon and decided to follow my originally planned route when skiing back. The route via Tortjerni was quite perfect and my memory called for locating Isbretjerni, then a huge, but gentle slope back down to the base of Harahornet. Proceeding as planned, I skied downhill from the lake, then suddenly realized that I was in a valley, not on a "huge slope".. This valley even seemed familiar. The peak ahead was not Harahornet, but Kyrkjebønosi, I was 90 degrees off course. Being back in the valley Øvre Skardet, I realized my mistake of not climbing across the ridge from lake Isbretjerni. What a day of continuously making small navigational mistakes. In any event, this way was certainly no worse than what I had planned as long as you know where you are. I skied down to the base of Harahorn, took a brief stop and applied more klister to the skis, this time the time honored Red Rode. Skiing up the Federskardet col was easy and soon (at 1330), I stood on the top of Harahorn. Here, I met other skiers for the first time. This peak is clearly where people ski. Lots of tracks and about 5 more people on the very summit as well as a few more coming from below. I left around 1350 and continued my traverse of the west ridge. 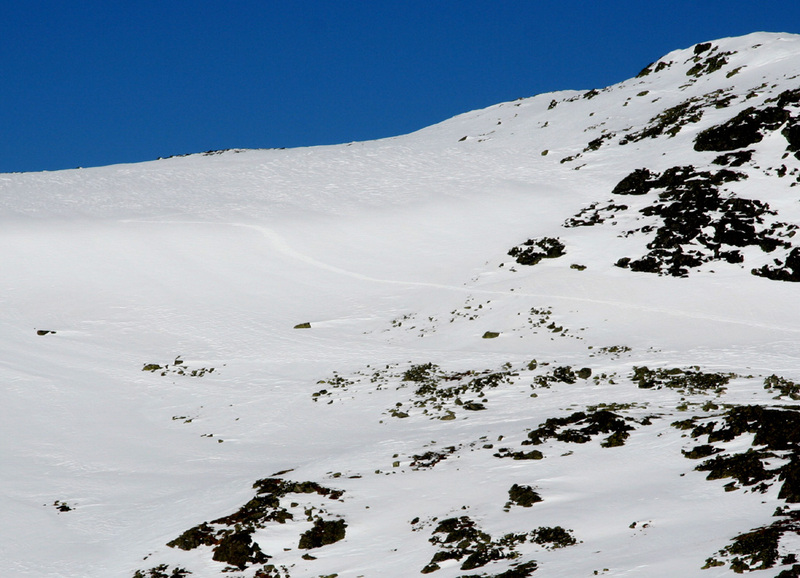 This ridge is distinct, but can be skied with some care. The trip was concluded by 450 meter vertical, continuously gentle downhill ending with a stop turn just two meter away from my car. I was back at 1415 and ready to enjoy a warm and sunny return drive at 1430. A near perfect day that will be remembered as the day my route finding at times seemed more like a random walk among sunny slopes than skiing mountains along reasonable routes. Veslebotnskarvet, as seen from Point 1734. Steep descent from Point 1734 towards Guteskardet. The slope above the rock is near 45 degrees a short section. Summit Panorama I, the view is north to Jotunheimen. Summit Panorama II, the view continues east. 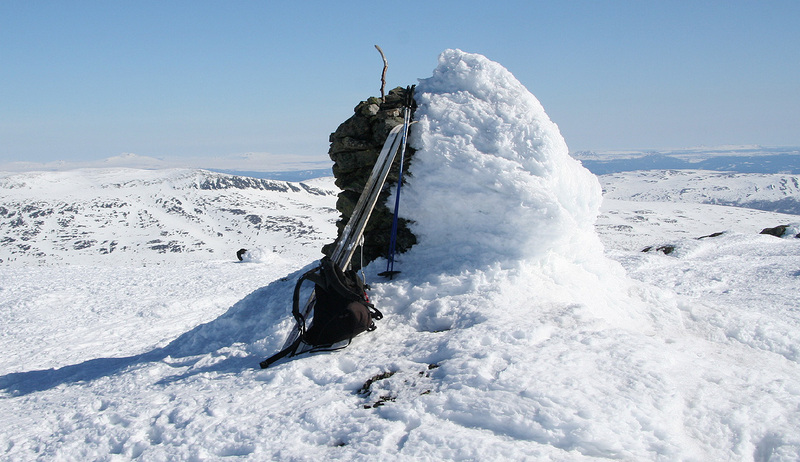 Summit Panorama III, the view continues to south-east. Summit view, south in the direction of Skogshorn. 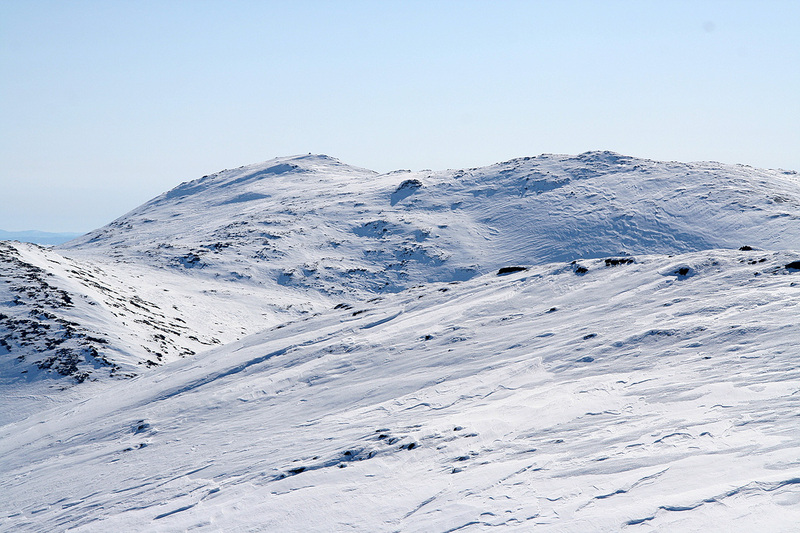 Summit Panorama IV, the view is south-west to west. Summit Panorama V, the view continues west to north.